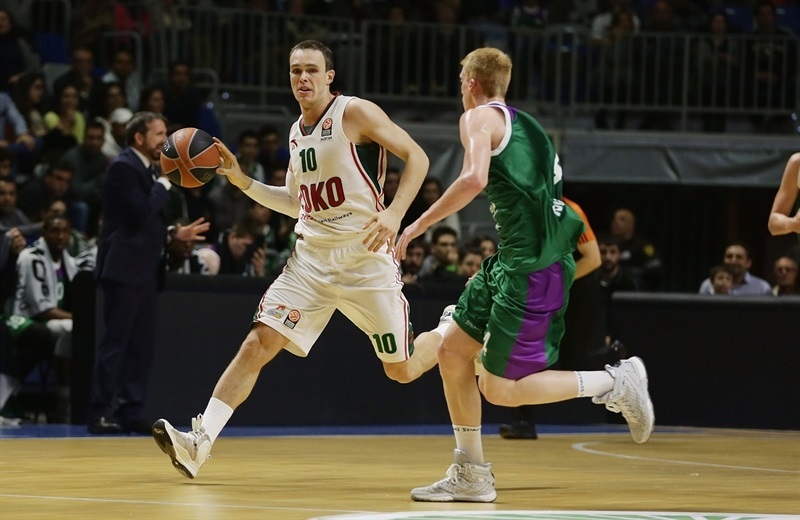 Lokomotiv Kuban Krasnodar grabbed its second road win of the Top by downing Unicaja Malaga 64-82 on Thursday. 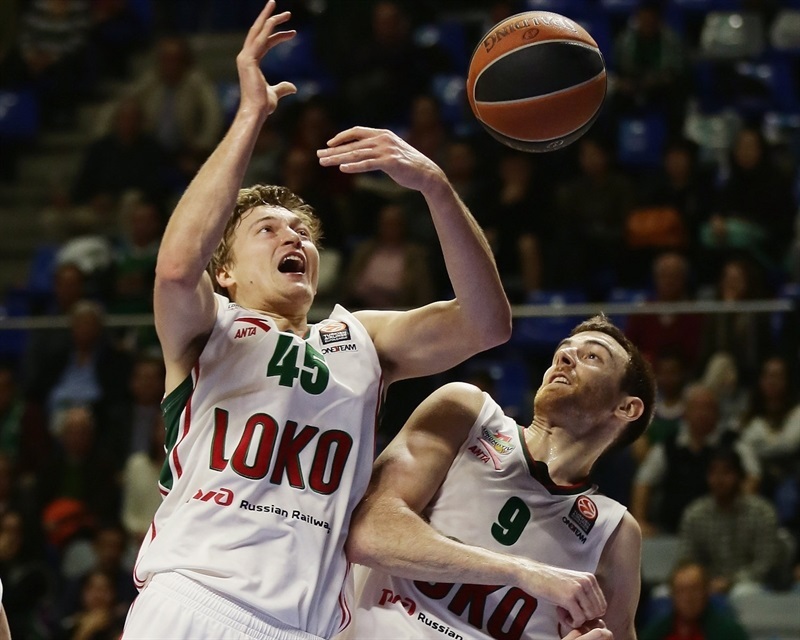 Lokomotiv improved to 4-2, while Unicaja fell to 2-4 after dropping its third consecutive game. 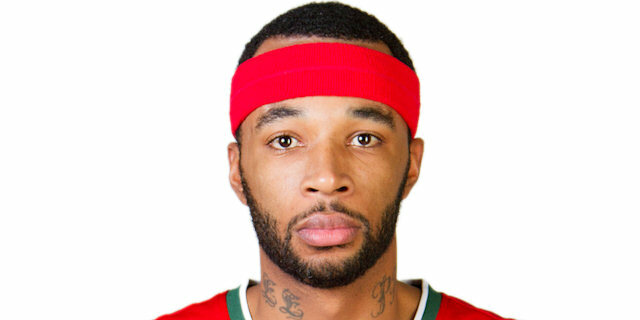 Malcolm Delaney led the winners with 21 points and 7 assists. Anthony Randolph added 18 points, while Dontaye Draper and Chris Singleton each had 11 for Lokomotiv. 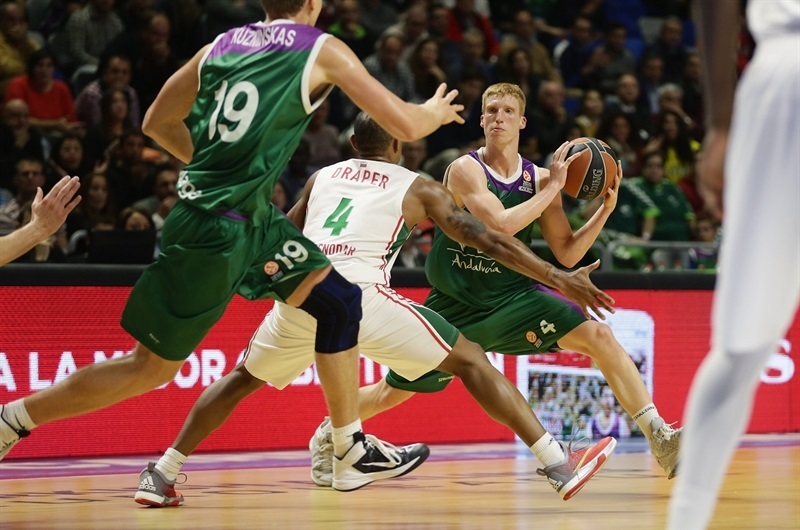 Mindaugas Kuzminskas led Unicaja with 16 points and Edwin Jackson added 11. Dani Diez and Jackson stepped up to give Unicaja a 30-23 lead midway through the second quarter, but Lokomotiv found its regular go-to guy in Delaney, who singlehandedly put the guess ahead, 32-34, at halftime. Delaney took over after the beak and got plenty of help from Singleton and Ryan Broekhoff to make it 47-60, at the end of the third quarter. Nothing changed from that moment, as Lokomotiv kept full control of the game until the final buzzer. DeMarcus Nelson got Unicaja going with a layup off an inbounds steal, which Mindaugas Kuzminskas followed with a fast break layup for a 4-0 lead. Ryan Broekhoff struck from downtown and Malcolm Delaney added his own three-pointer to give Lokomotiv its first lead, 4-6. After Broekhoff scored in penetration, Kuzminskas shined with a jump hook. A reverse dunk by Anthony Randolph boosted the guests' lead to 6-10. Nelson buried a triple and a jumper by Jamar Smith restored a Unicaja lead, 11-10. Kuzminskas kept pushing the hosts with a three-pointer and a jump hook, as Lokomotiv struggled to find the way to the basket. Lokomotiv was held scoreless for more than three minutes until Delaney downed a stop-and-pop triple. Victor Claver also struck from beyond the arc to tie the game at 16-16 after 10 minutes. Claver took over with a big dunk off the baseline early in the quarter. Jack Cooley split free throws and a corner triple by Alberto Diaz put Unicaja back in charge, 20-18. Chris Singleton and Edwin Jackson traded three-pointers and a big basket in traffic by Dani Diez gave Unicaja a 25-21 edge. Evgeny Voronov found space for an uncontested layup, but Diez scored again and Jackson nailed his second triple to make it a 7-point game. 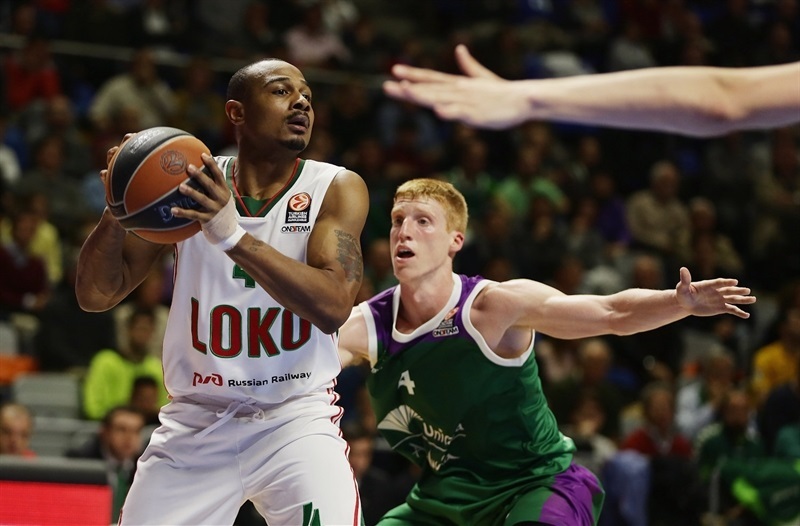 Unicaja was all over the place on defense, not allowing Lokomotiv to organize its offense. 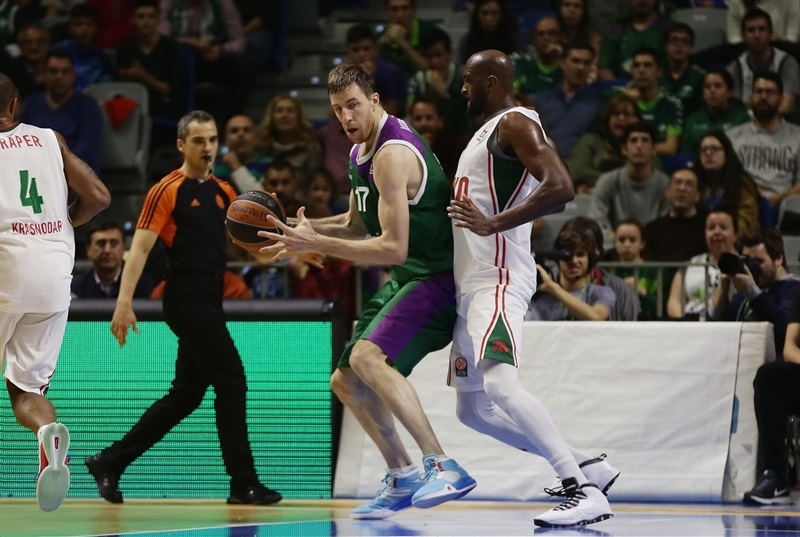 Andrei Zubkov rescued the visitors with a layup-plus-foul, as Unicaja tried a more versatile lineup with Kuzminskas, Carlos Suarez and Fran Vazquez together on court. Delaney and Kuzminskas exchanged free throws, but Delaney downed back-to-back three-pointers to put Lokomotiv back ahead, 32-34, at halftime. Both teams struggled to score after the break until Randolph stepped up with a dunk. Delaney took over with a wild step-back triple, but Kuzminskas matched that with a layup-plus-foul. Delaney hit a technical free throw and a jump hook by Randolph boosted the guests' lead to 35-42. 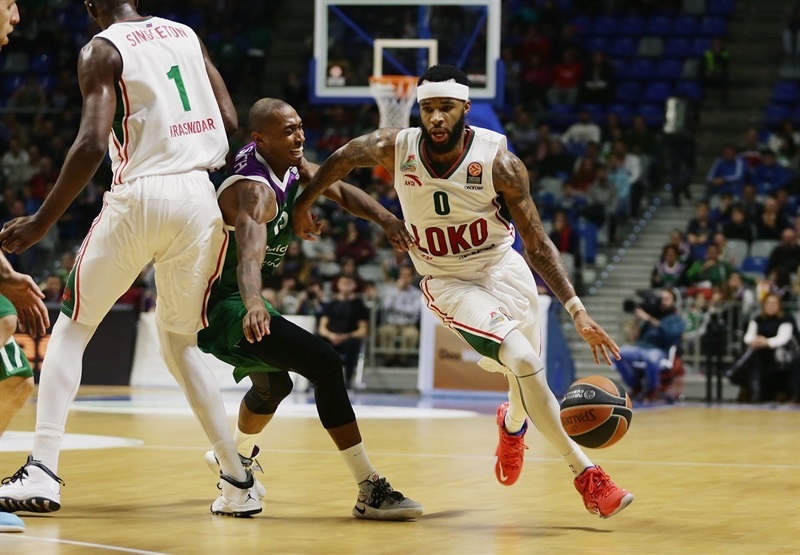 Thomas made free throws, but a three-pointer by Singleton kept Lokomotiv way ahead, 38-45. 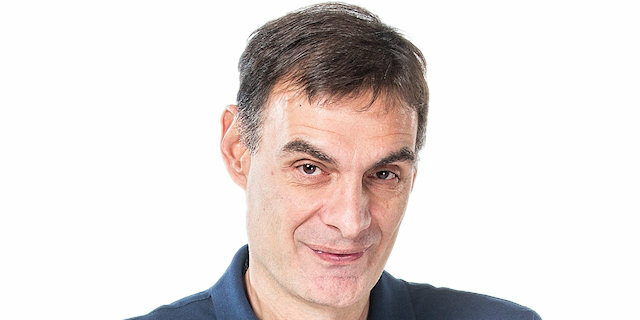 Thomas kept pushing Unicaja with a bomb from downtown, but Dontaye Draper and Broekhoff each hit one from beyond the arc, which prompted Unicaja to call timeout at 41-51. Kuzminskas hit foul shots, but Delaney did better with his sixth triple. 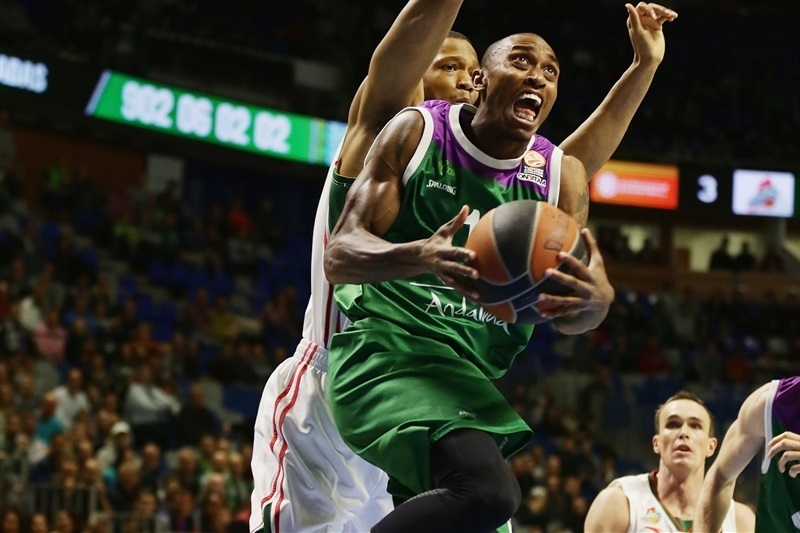 Jackson tried to change things with a stop-and-pop jumper, as Unicaja switched to a 2-3 zone defense. The hosts kept struggling to score, however, and Draper finished a patient Lokomotiv offense with a corner triple. Cooley scored down low and a three-pointer by Singleton fixed the score at 47-60 after 30 minutes. Draper scored off a midcourt steal early in the quarter. 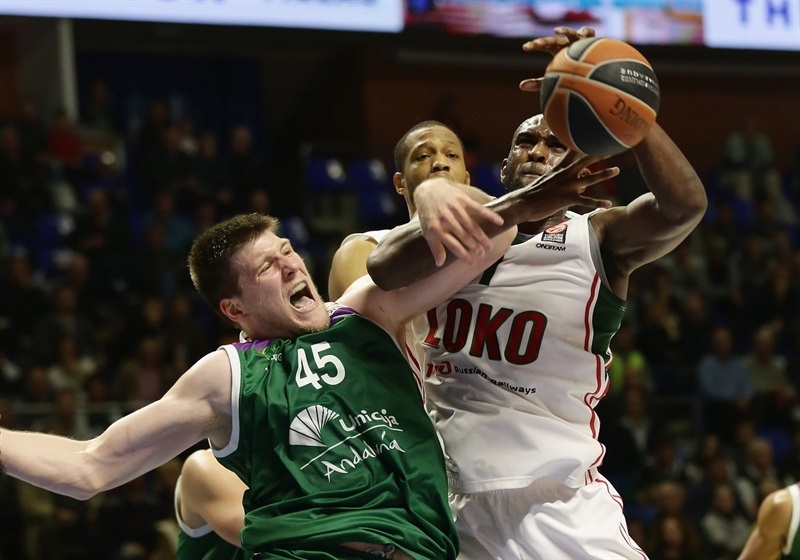 Jackson answered from downtown and Diez added a corner triple to give Unicaja hope at 53-62. Delaney found Randolph for another slam and Draper hit another triple, this time from the left corner, to break the game open. 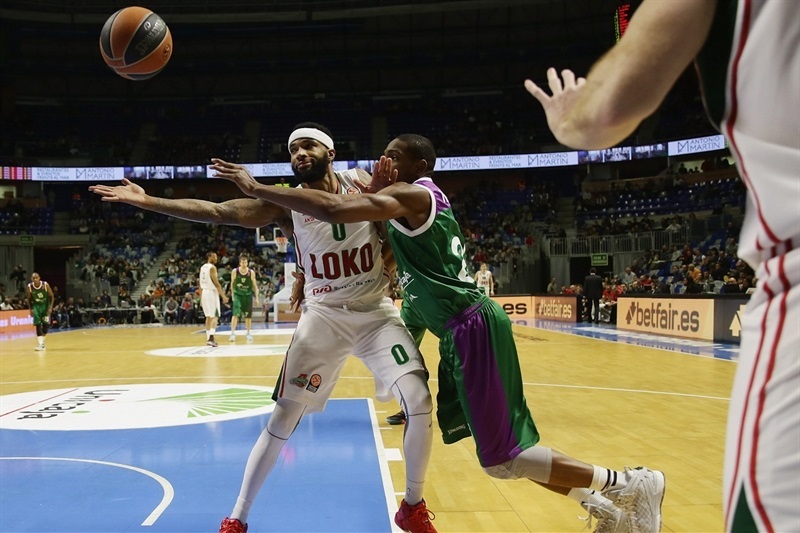 Unicaja called timeout, but Lokomotiv kept excelling on defense and a three-pointer by Claver sealed he outcome at 53-70 midway through the quarter. Randolph followed a mid-range jumper with a layup before Unicaja called timeout down 21. Cooley and Nemanja Nedovic made free throws, but by the time Singleton hit another jumper, everything was said and done. 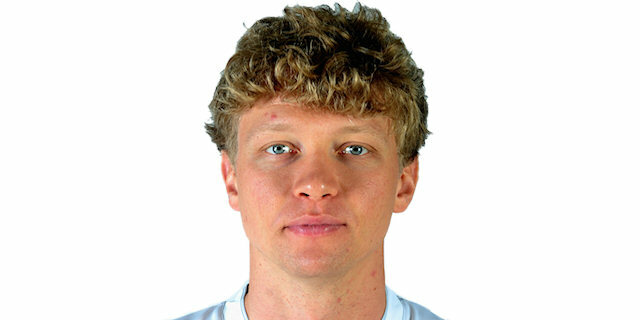 "I believe that Kuzminskas has explained really well what happened to us tonight. We handled the game the way we wanted in the first half. Even with that, in those two opening quarters, we were in some situations which showed we were not controlling the game, like their three-point threat. We knew we played against a team able to score from long distance in the final seconds of its possessions and didn't want that to happen - and it happened, even when we were still in the game. When we stopped being able to score at the same level as they did and started to commit turnovers, they broke the game and even when it looked like we could get close, we didn't play with the toughness we needed. I believe we lacked toughness today, physically and mentally. It is obvious that this is not the image we want to show, not by any chance. We tried to make some defensive adjustments, but were not able to stay calm on offense. We had a poor two-point shooting percentage, under 40%, and it is difficult to beat anybody with those numbers, no matter if you do other things right, which also wasn't the case. We made a lot of turnovers and didn't dominate the defensive rebounds as we wanted. We lacked experience and toughness. We have to think about the next game." "Every win is very important, especially away from home. We shared the ball extremely well in the second half and played unselfishly, which is very important for us. Our shooting defense was also great. 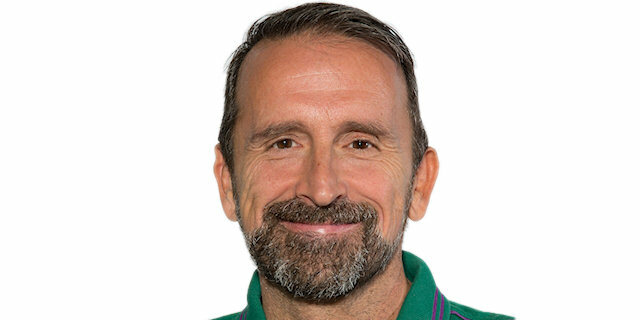 I have to congratulate my players; this is our second win on the road and we are looking forward to the next game. I didn't count how many three-point shots we made but for me, the important thing is that we created open shots." "First of all, we were really soft, especially in the second half. Even when we had a chance to run away from then when we were up by 6 points, which we didn't use. We didn't follow or execute our game plan for this game and you can see that with this terrible result for us. We didn't stop their three-pointers, they made 16, and didn't stop their fast breaks. We didn't stop anything." "We did not play the way we are supposed to play at home. We knew that we had to be strong at Martin Carpena, but lost the last two games at home, which were very important for us. It is time to row in the opposite direction and try to win against difficult teams on the road. We will do our best to try to do this to overcome this situation. In the second half, we lost the intensity we want to have and this is when the game went out of reach for us." "I just try to come out and Coach does a good job setting the system out so that I can play well. He did a really good job preparing us for this game and I knew I would get my shots and assists. I just followed the game plan and it worked out. I am pretty confident. I work hard and try to do my best every day in practice and on the court. This year, I have a good coach that believes in me and thought it would be a good year for me."